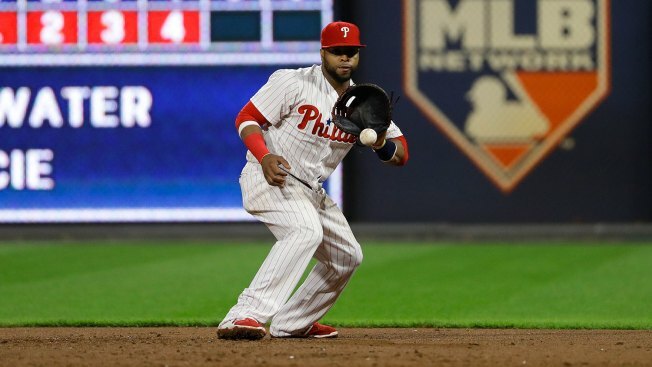 DENVER – Carlos Santana started at third base for the 10th time this month for the Phillies on Monday night. It almost feels like a tryout. Manager Gabe Kapler began giving Santana starts at the position in early September because it allowed him to get Justin Bour's bat in the lineup at first base. Recently, Kapler has used Santana at third as a way to improve the Phillies' outfield defense. With Santana at third, Rhys Hoskins can move from left field to his natural first base and Kapler can use a stronger defender in left. On Monday night, he used an outfield of Roman Quinn in center, Odubel Herrera in right and Aaron Altherr in left. It was all about covering the vast green that is the Coors Field outfield. It's no secret that Hoskins has struggled defensively in left field. The idea of moving him back to first base next season has been discussed by club officials. Hoskins would be more comfortable there and the Phils could seek a defensive upgrade in left. But what do you do with Santana, who is signed for two more years at $40 million. The Phils have discussed dealing him this winter, but that might be difficult. Could playing him at third base in 2019 be the solution? "It's something that we'll sit down with a little bit more perspective and a little less emotion and evaluate when the time is right," manager Gabe Kapler said Monday. There are variables to consider when weighing the possibility of using Santana at third base full time. One is Manny Machado. The Phillies are going to make a free-agent run at him this winter. He would look good at third base, but he might want to play shortstop and the Phils would probably be open to that to get him. Another is Maikel Franco. He had some big downs and some big ups in 2018. Will the Phils keep him or look to deal him? The guess here is they will look to move him. The other matter to consider is Santana's defense. He does not have good range. Would the Phils, already a poor defensive team, be able to live with Santana's defense at third? They seem to be gathering answers this month. "I think his performance thus far at third base has been good," Kapler said. "I don't know how predictive that is of what we might get from Carlos at third base moving forward." Santana, 32, actually began his pro career as a third baseman in the low minors with the Dodgers in 2005. He eventually was moved to catcher and then first base with the Indians. How would he feel about playing third base next season? "I'd be open to it," he said. "I'm prepared for any situation. All I care about is being in the lineup every day. It doesn't matter if I'm at first or third." The Phillies, staggering to the finish line, lost their fifth straight game and are now 15-30 since leading the NL East by 1½ games on Aug. 5. They were 15 games over .500 on that date. They are now 78-78 with six games to play. It is the first time they've been .500 since April 10. A sixth straight losing season looks to be in the cards.